Chevrolet introduced its new Chevelle on September 26, 1963 on its newly designed A-body platform. The main idea was to create a mid sized car with a large sized engine. Interestingly enough, the 1964 Chevelle was the only brand new production car introduced in 1964. The 1964 Chevelle was available in several trim levels including the Chevelle 300, Chevelle Malibu, or Chevelle Malibu Super Sport. Each configuration could be ordered with a six cylinder or V8 engine (even the Chevelle Malibu SS). Body style included 2 door sport coupes, 2 door sedans, 2 door convertibles, 4 door sedans, 2 door wagons, or 4 door wagons. Between all of the different body style, engine, and transmission choices, there were 22 unique offerings to prospective buyers. Interiors could be optioned with either bucket seats or bench seats and were available in a variety of colors. The most popular were Aqua, Black, Light Blue, Light Fawn, Red, Saddle, or White. The buyer could have ordered a number of different exterior colors including Tuxedo Black, Meadow Green, Bahama Green, Silver Blue, Daytona Blue, Azure Aqua, Lagoon Aqua, Almond Fawn, Ember Red, Saddle Tan, Ermine White, Desert Beige, Satin Silver, Goldenwood Yellow, and Palomar Red. If those choices were not enough, the buyer could have also opted for a two tone paint scheme. Convertible tops were available in white, black, or beige. To complement the wide variety of available colors were the available drive train combinations that could be opted for on the 1964 Chevelle. Base power was had by one of two available six cylinder engines. Buyers who wanted more power could opt for aV-8. Manual transmissions were either 3 speeds or 4 speeds and the only available automatic transmission was the 2 speed Powerglide. 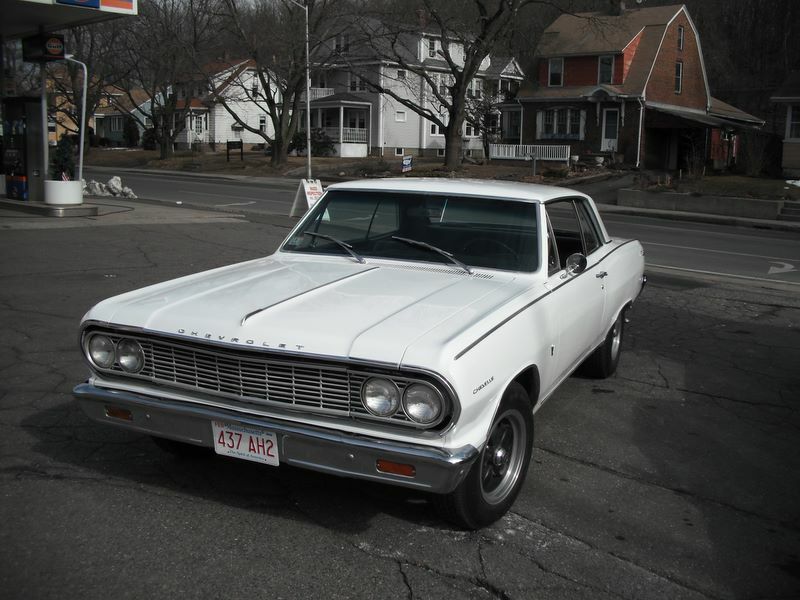 About 338,300 1964 Chevelles were produced in 1964.